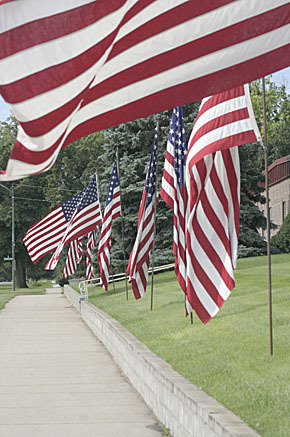 Albion and Boone County will honor war veterans at the annual Memorial Day ceremonies next Monday, May 31, at 10:45 a.m. on the courthouse grounds. The outdoor ceremony will be preceded by a 10 a.m. worship service at Zion Lutheran Church. Guest speaker will be Donald H. Schriver of Weatherby Lake, MO, a decorated Vietnam veteran and brother of rural Albion residents Bill and Ken Schriver. Bill Schriver and Merle Klassen will serve as directors of ceremonies. Members of various veterans’ organizations, Girl Scouts, Boy Scouts and Cub Scouts will take part. Rev. Larry Sydow will give the invocation and benediction. A Living Auxiliary Award will be presented to a local Legion or VFW Auxiliary member during the ceremony, and the mini-park flag will be raised in her honor after the ceremony on the courthouse lawn.